Just Want to Be in Position 1? This guide is an introduction to bidding and bid strategies, providing you with a basic introduction to each type of bidding and the overarching concepts that drives how and why advertisers use these strategies. We cover each individual bidding method (such as CPC or vCPM in guides specific to those methods. Bidding is one of the most important and intrinsic parts of AdWords or indeed any online advertising platform. This is the mechanism used for paying for the service, having people see or click on your ads. Bidding comes in many different flavours depending on the campaign type, campaign sub-type and the targeting options used. These factors will limit or expand your bidding options depending on how the campaign is set up. The other component that influences advertiser’s decisions when choosing a bidding method (beyond simply limiting or expanding options) is the goal of the campaign. For example; if you are looking to drive brand awareness then a CPM model will likely be the most effective for your goals. A bid is typically set as a maximum you will pay for an action by a user such as a clicking on an ad, a view (or thousand views) of an ad. Manual bidding provides advertisers with the most control over their account and campaigns but also typically requires more work. Generally manual bidding methods are more popular with advanced users than with newbies. Manual bids are set and optimised according to your campaign goals, for example; you may set bids according to the maximum you can afford to pay per click based on ROAS or CPA targets. Or you may be targeting a position within the paid SERPs or simply be trying to get the most amount of clicks as possible. Automated bidding allows Google (or their algorithm) to automate bids according to the bidding strategy that you have chosen. Bids are set / reset multiple times per day in order to hit the specified targets. Bidding can also be more strategic such as when using automated bid strategies like CPA (Cost Per Acquisition) Target or ROAS (Return On Ad Spend) Targeting. Automated bid strategies help to reduce workload and theoretically assist you in hitting targets or achieving goals. The reality of automated bidding strategies is that they can often miss the mark on targets and some see there being a conflict of interest in that you are handing bidding over to the same people you are paying for your bids… Which is a bit like letting the casino make your bets for you! Ultimately when choosing between manual or automated bid strategies you are choosing what degree of control you would like to have; with manual bidding being at the ‘total control’ end of the spectrum. Specific automated bidding options are described in more detail later in this guide. Using the wrong bidding strategy can result in unintended or unwanted performance from the account. When you set the campaign type and sub-type, you will restrict the options for bidding to only those available with the settings you have chosen. For most automated bid strategies require you to have enough conversion data in order to use them. That said, if your campaign is eligible for a number of bidding options, it is important that you choose the one most suited to your goals. No bidding method allows you to ignore your bids after setting them, no matter if its manual or automated, you will need to continually check performance and make changes. There is no catchall answer as to what strategy you should use, align your bidding strategy with your campaign goals. 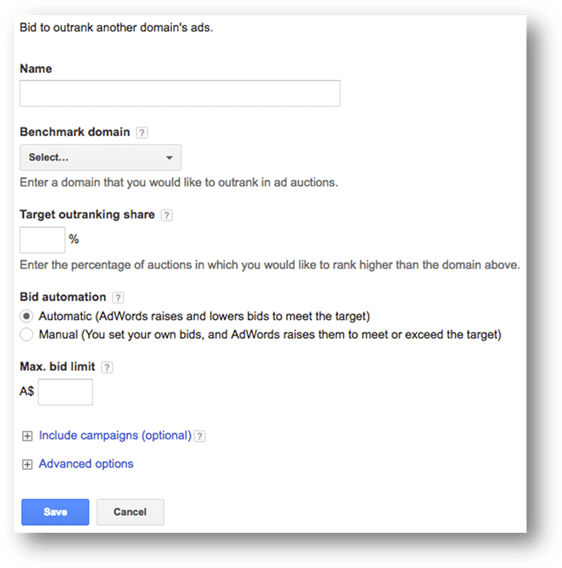 We discuss briefly each of the methods for bidding available in AdWords below. CPC (Cost Per Click) bidding is the default and most basic type of bidding available in AdWords. You manually set bids at ad group or keyword level and Google will use this as an upper limit on what you will pay for a click. CPC bidding although basic, actually provides the advertiser with the highest degree of control over what they pay than any other bid strategy. Google automated bidding can be unpredictable or inaccurate, especially when dealing with small data. Manual CPC bidding puts all of the control in your hands and thus requires some skill or guiding strategy to be effective. If you are working with CPA targets or ROAS (Return on Ad Spend) / ROI (Return on Investment) targets, you can use spreadsheets and formulas to determine the CPC’s programmatically. We cover this and more in greater detail in our guide to CPC & eCPC Bidding. To provide an analogy of this tool; if you were polishing shoes on a stand in a busy high street, you would be more likely to spend time trying to convince someone with shoes that can be polished rather than someone with sandals. The same is true in AdWords, where Google see’s the user as potentially more likely to convert, it will increase your bids to try and ensure you get that user to your site. This is a form of automation, but the amount of automation is about as small as it can be. Google considers, time of day, device, location and device among other factors when trying to determine whether a user is more or less likely to convert. The Mobile bid adjustment is taken into account when raising bids to drive conversions. CPCs can be increased up to +30% when using enhanced CPC’s and this is applied after any bid adjustments. CPC’s can be reduced by more than 30% when Google does not think the user is likely to convert, ensuring that you pay less for users who are less likely to convert. The default conversion metric used is ‘converted clicks’; this can be changed to ‘conversions’ if you prefer that this metric be used instead. If your ad rotation settings are set to ‘optimise for clicks’, then you chose to use enhanced CPC, your ad rotation settings will be changed to ‘optimise for conversions’. This technically falls under the automated bid strategies but since a revamp has been rather confusingly aggregated in with the portfolio bid strategy (previously known as ‘flexible bid strategy’). Now when you select ‘Target CPA’ (Cost per Acquisition) you can choose to use the conversion optimiser version, or apply a portfolio bid strategy to the campaign. For the sake of ease (and some posterity) we shall refer to ‘Target CPA that isn’t a Portfolio Target CPA’ as Conversion Optimiser… This is an automated bidding strategy that allows Google to control the bidding in order to achieve a target CPA. If for example you have a target CPA of $20 for a product that you sell, Google will adjust bids according to when it thinks users are likely to convert to achieve this target. The tool is very useful and allows for automated micro control over bids in a way that a human could never do, but it’s not a magic wand that delivers whatever target you set. There are also requirements that need to be met before a campaign can qualify to use Conversion Optimiser. Read more about Target CPA / Conversion Optimiser by clicking the link. Google say “Automated bidding takes the heavy lifting and guesswork out of setting bids to meet your performance goals” … We would argue that Google simply shifts the guesswork from you to them! That said, these automated bid strategies can work under certain condition and in certain areas. Bear in mind that you will need to create your portfolio strategies from the shared library or on the fly when making a campaign. We describe these below briefly but explore each one in much more detail in separate guides linked to from each of the following sections. Target First Position – Bids (CPCs) will be optimised and automated to target the 1st position in the paid SERPs. Target First Page – Bids (CPCs) will be optimised to meet the minimum first page bids, ensuring that your ads are predominantly on the first page. All of the usual factors still come into play to affect cost and ad rank, such as QS (Quality Score). Read more about target search page location by clicking the link. We described earlier in this guide how the standard (or non-portfolio) bid strategy version of target CPA (Cost Per Acquisition) works, here we address the portfolio version of this. You will need to have conversion tracking enabled and setup correctly in order to use this, in addition you will also require reasonable volumes of historical conversion data before using this strategy. Target CPA strategies allow Google to automate bidding in order to hit the CPA target that you have specified. This can then be applied to campaigns, ad groups, etc and works across all components that it is applied to… For example, if you apply the same Target CPA bid strategy to three campaigns, each individual campaign could be above or below CPA but the aggregate or collective CPA across all campaigns should be close to the target. That said, this is not always the case and some time is needed for the tool to learn and then reach optimal performance. This will vary depending on number of factors such as how much data is available to learn from. Read more about target CPA by clicking the link. ROAS is ‘Return on Ad Spend’ and hence a Target ROAS strategy automates bids to hit a ROAS that you have specified. For example, if you want to get a 150% return on your ad spend you would essentially make $1.50 for every $1 you spend. Thus you would set the ROAS target to 1.5 or 150%. In addition to the conversion tracking required described in the Target CPA section above, you will also need to set up conversion values or have eCommerce tracking setup. Google needs to know the value of conversions or products to be able to optimise to ROAS. Again, it is worth noting that this is not always accurate, not always relevant or applicable to every campaign (even if it is tracking revenue or conversion values). There is a period of learning that can vary from one to six weeks and optimal performance may not result in hitting the ROAS target. Read more about target ROAS by clicking the link. This would be relevant to a small percentage of businesses or campaigns, but you can use this bid strategy to try and outrank a specific competitor for your target keywords. You set the ‘target outranking share’ as a percentage (illustrated in the image below); this determines what percent of auctions you would like to outrank the specified domain. You can set this to automate bidding or manually manage bidding depending on how you would like to have the bids managed. It is worth noting that this technique may not improve your ad position objectively, but rather relative to the target domain… And your ads will still be subject to the typical influencing factors such as your QS and Maximum CPC bid. Read more about target outranking share by clicking the link. Google aims to increase Clicks in all campaigns using this bid strategy, showing your ads and adjusting bids in order to maximise the number of clicks you get. As the image above shows, there are two settings with which to customise this bid strategy that we describe below. 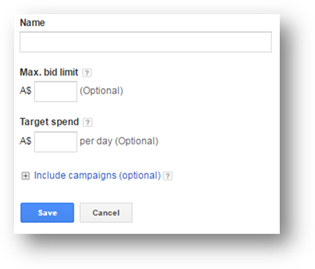 CPC Bid Limit – As shown in the image above the Max Bid Limit is a maximum CPC bid to limit the Cost Per Click. Google will try and get as many clicks as possible with this maximum CPC and within your daily budget. Target Spend – This is the total budget to be used across all of the campaigns to which this strategy is applied. In this case budget can be distributed across a lot of ad campaigns and / or ad groups and keywords to maximise spend to achieve the maximum number of clicks. Read more about maximise clicks by clicking the link. This is a bidding methodology that allows you to bid on impressions rather than Clicks, often used for branding campaigns rather than direct response. This is referred to as CPM (Cost Per Thousand Impressions) bidding, where the equivalent of your CPC is an amount you pay for every 1,000 impressions you receive. Viewable Impression bidding allows you to pay per 1,000 viewable impressions rather than per click or using a target CPA. You can set default bids at ad group or targeting level (keyword, placement, etc.) with this bidding method. Active View viewable impressions are counted only when 50% of the ad (at least half of the ad is viewable) shows for at least one second. Hence the word ‘viewable’ is used, even if a webpage loads with your ad on it, and the ad has to be viewable to be counted here. Click the link to read more about Viewable Impressions or this link to read more about Viewable CPM Bidding. As mentioned, bidding should be driven by your goals, hence it’s very important to have clear goals and well defined achievable targets where possible. We have set out below some of the most popular goals and a description of the best bidding options to use in order to achieve these goals. In the next section of this guide we cover in more detail how to achieve some of these goals. We have described the basics of what bidding is above, ‘bidding strategies’ are more strategically driven plans or approaches to bidding in general. You can use either a manual or an automated bidding method in a strategic way. Although automated bidding is referred to as a bidding strategy it is entirely possible to manually perform the task of optimising to a target CPA or ROAS while using CPC bidding. The component of bidding that makes it a ‘strategy’ is having a goal that you are aiming to hit. This invariably leads to the need for understanding the relationship between different metrics such as Clicks and CPA. We describe below these mathematical relationships and how you can use them to apply new bids to keywords or ad groups with some historical data. Bear in mind that you will need to have conversion tracking and conversion values setup in your account to use the methods described below. If you have a CPA target for a campaign or a product you need to adjust bids regularly to ensure you are hitting your target. CPA is calculated by taking the cost (spend) and dividing it by the number of conversions, for example; if you have a cost of $1,000 and 100 conversions, you will have a CPA of $10. If we take an example set of data (see below) we can start to apply some basic maths to help us define what are new bids should be. In the column on the right-hand side of the table you can see that we have included some percentages, these are calculated by dividing the CPA by the Target CPA… Where a result of 100% means the keyword is bang on target, anything over 100% means that the target was exceeded and anything under 100% came in under the CPA target. Here we have added a new column which multiplies the ‘Avg. CPC’ by the ‘Missed Target By’ metric to get the new Max CPC. Many advertisers work to a ROAS or ROI (Return on Investment) target which is calculated by dividing the Revenue by the Cost to get a number, which is typically represented by a percentage. If you have an ROI of 100% you will be breaking even, in that every dollar you spend will yield $1 in revenue. If you have an ROI higher than 100%, you are making a profit and anything less than 100% will make you a loss. Let’s assume a data set (see below). Unlike the first two methods described above, there isn’t a specific formula that can be applied in all instances. In these cases, you will need to use some ‘guestimation’ with your bids and monitor the results that ensue as a result of this. There are many components to achieving a position such as the QS (Quality Score) which includes historical performance of your ads. In some cases, it will not be possible to achieve a top position without improving your QS first. We recommend using small incremental changes to bids and monitoring their effect on Avg. Position over time. If you group / filter keywords by Average position, you can up bid or down bid keywords based on whether they are on average too high or too low in the SERPs. There are some additional things to consider here, such as the current Max CPC and the Avg. CPC… If you average CPC is much lower (more than 20%) than the Maximum CPC bid, increasing the bid is not likely to improve the position of the ad as it may have already reached an equilibrium between QS, Bid and Ad rank. If we assume a target impression share of 50% and you currently have an impression share on the campaign of 15%... If this is limited solely by budget you can calculate the budget you need by dividing the current budget by 0.15 and the divide the result by 2 to get a 50% impression share. Making decisions on what value to set bids to should always be done with care and fastidious eye for detail. These techniques described here can be applied to keywords with enough data to make a decision, we would not apply this formula to keywords with only 5 Clicks for example. When the volume of data is too low it allows for anomalies to creep into the data. It is possible for a keyword to have have received a few clicks and either perform exceptionally well or exceptionally bad… When the volume of clicks is higher, the role of anomalies is reduced significantly. There are other factors to consider if you are using CPA or ROAS bidding, such as conversion rates… If your keywords have a low conversion rate of say 1%, you will need at least 100 Clicks in order to have any conversion data at all. However, a single conversion is not enough data with which to make a decision. In this example you would likely need at least 500 to 1,000 Clicks in order to have enough data to set the bid. Conversely, if you have high conversion rate of say 30% you will have 30 conversions when you have just 100 Clicks, if this conversion rate is in-line with the account as a whole and does not strike you as anomalous, you could use this to reset bids. If you do not have enough data and you go ahead setting bids for keywords, you may find that account performance goes quickly in the wrong direction. Working with data that is obviously anomalous will often result in unwanted or unexpected changes in performance. Using the example above, if you were to reset a bid on a keyword with 3 clicks and 1 conversion, that has come in massively under the CPA target, you could blow your whole budget on just a few expensive and potentially unwanted clicks. Anomalies tend to be averaged out over time with more data, so you can either look at a longer date range for keywords without enough data or wait until you have enough to make a decision. If the number of clicks is less than 500 the cell will return the current Avg. CPC value, if not it will apply the formula. This can be expanded to include ‘IFS’, where you can specify multiple criteria such as a minimum number of clicks and a minimum number of conversions. Another very important factor to consider when setting bids or working with bid strategies are ‘bid adjustments’. Bid adjustments are applied to bids to either increase or decrease your bids for any of the following segments of users. This can be very useful if you find areas of high or low performance in any of the areas below and you would like to take action on that data. There are a number of other factors to consider with bid adjustments such as when they are stacked but we cover this topic in more detail in our guide to bid adjustments. You can adjust bids for mobile devices in order to take advantage of mobile opportunities or reduce unwanted mobile traffic. Bids can be set anywhere between -100% to +300% at ad group or campaign level, where a bid adjustment of -100% will reduce mobile traffic to zero. This feature provides significantly less control than advertisers previously had before the new ‘enhanced campaigns’ were released some years ago. It is also currently not possible to set bids or bid adjustments for tablet devices. Location bid adjustments can be set if you have added multiple locations to a campaign. It is good practice to add all major locations to any campaign that constitute sub-regions of the main target region… For example, if you added Australia as a target region, you could also add all of the states and major cities. This will then provide you with data about how many people clicked ads, converted, etc from each region you have listed. Once you have this data you can analyse it to make decisions about what bid adjustments you would like to set for each region / location. Bid adjustments can range from -90% to +900% at campaign level only; meaning that you cannot completely remove traffic through bid adjustments. Probably one of the most commonly known about of the bidding options, ad scheduling is a powerful tool allowing you to adjust bids based on the time of day or day of the week. You can see in the ‘Dimensions’ tab within AdWords, you can see data segmented by ‘day of the week’ and ‘time of day’. Bid adjustments can range from -90% to +900% at campaign level only, meaning that you cannot completely remove traffic through bid adjustments. This enables advertisers to capitalise on peak hours or peak days for business, gaining a greater impression share when traffic is at its most valuable. Read more about this topic in our guide to ad scheduling. Both on the Display Network and on YouTube, it is possible to set bid adjustments for content that has been measured by Google’s system to be more popular. When your ads are eligible to appear on this content, Google will use your bid adjustments to increase your bids; meaning that your bids can only be increased not decreased with this type of adjustment. The range available to you is 0% to +500% and can be applied only at the ad group level. If you are using the display network to target users you can set bid adjustments for those targeting options (topics, interests and placements). This provides advertisers with a more granular level of control over these targeting options. Bid adjustments can range from -90% to +900% at campaign level only; meaning that you cannot completely remove traffic through bid adjustments. If you use Remarketing Lists for Search Ads and intrinsic feature of this allows you to increase or decrease bids for search network users who have been to your website in the last 30 days (are in a remarketing list that you are targeting). Bid adjustments are set at the ad group level and can range from -90% to +900%, for more information on this topic please read our guide to Remarketing Lists for Search Ads.